How about a PARTY to show Florence that she did not and will not get the best of us? Thank you for a great 9 years, Wilmington! 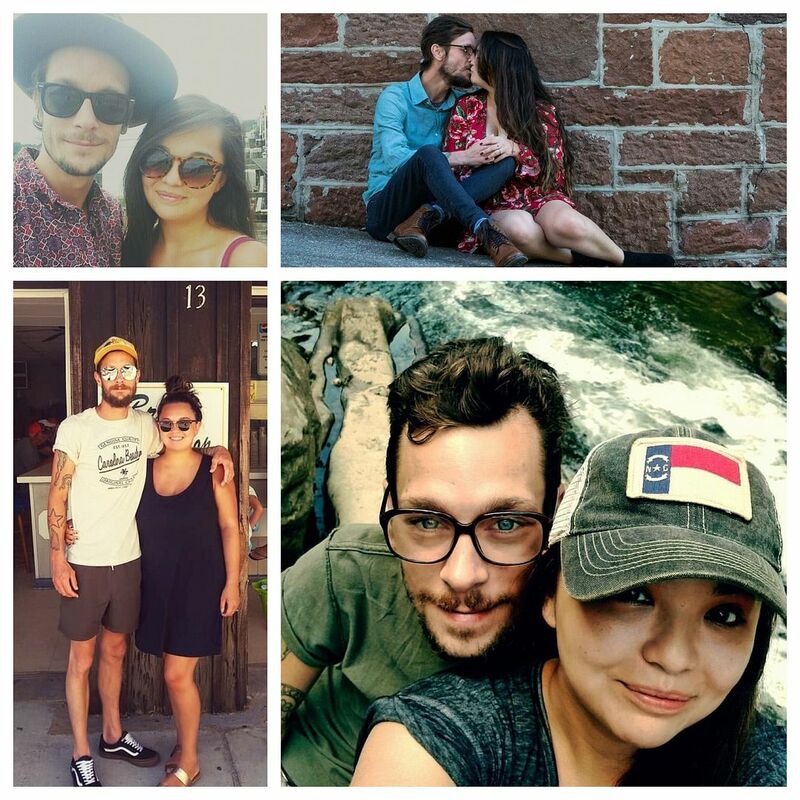 But this year, we have an even more special event to celebrate…the upcoming wedding of our own Haley & Jesse! The cutest, sweetest, most hard-working couple ever. 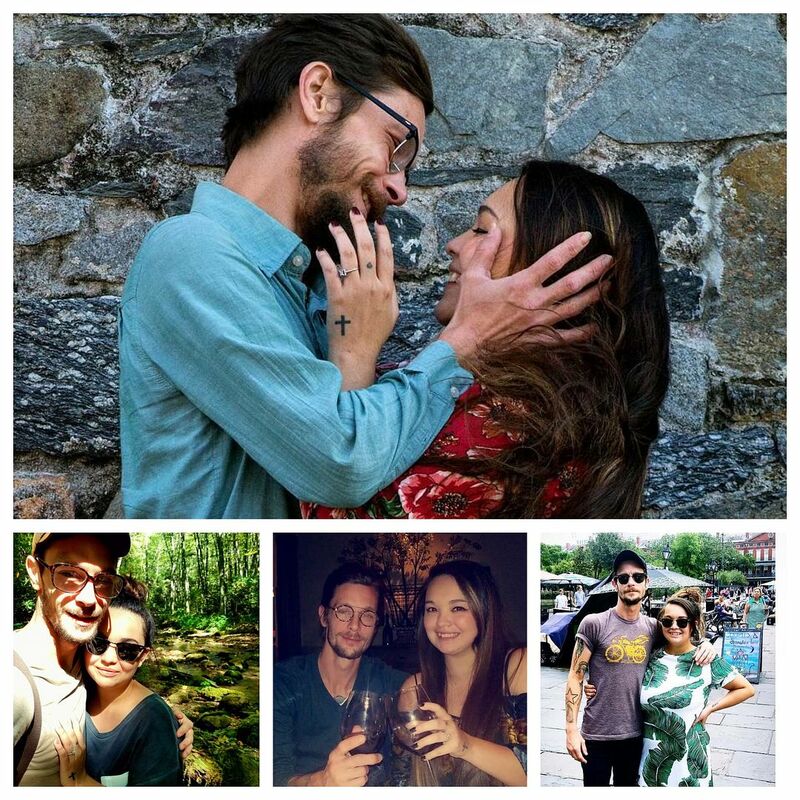 Want to see their wedding details? Click the button! But this week’s new arrivals are also pretty exciting. Nice neutral sectional, brand new, $1,095. 114×82. Hand embellished abstract, $202, 49.5×36. Pillows, $18-$42. Just in on consignment and in absolutely like-new condition. White driftwood queen headboard, $325. Dresser, $450,65x19x39″h. Bedside tables, $225 ea, 22.25x18x29″h. Accent vases, $42 & $75. We have two of these azure blue accent cabinets which could make great bedside tables. $325 ea, 36x15x36″h. Three-way recliner in oatmeal, $670. Can be ordered in other fabrics. Beachy oil painting framed in a driftwood finish, $328, 66×36. Shorebird lamps, $165 ea, 32″h. Another great consignment find, oatmeal sofa just $450. 86x39x40″h. Sorry, coffee table and polka dot pillows have sold. You must see this 65″ pedestal table in person. A deal at $495, has some imperfections on the top. Lee Industries Parson’s chairs, $95 ea. Six available, sold in pairs only. Pristine muslin underneath slipcovers. 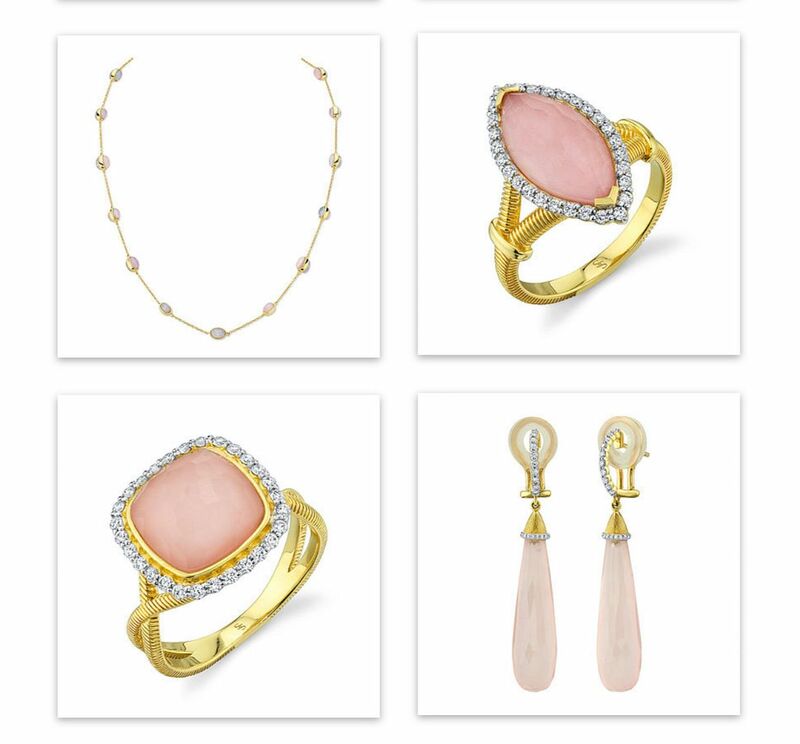 Just in on consignment…some AMAZING classic pieces. We have a pair of these red apothecary chests, $295 ea. 37×14.5×36″h. Three tier side table in black by BAKER, a deal at $225. 24x14x26″h. Just in on consignment, cozy club chairs in grey ivory, $295 ea. 34x36x36″h. Everyone can always use more storage, or a great place for the tv. Grey credenza, $425, 67.5x14x36″h. Ivory mirrored, $595, 67x16x36″h. Oatmeal slipcovered sofa, $715, 78x38x40″h. Coordinating chair available, $445, 32x38x40″h. Fine art textured giclee, $295, 49.5×38. Wooden coffee table with glass inlay, $112, 48x24x17.5″h. These palm motif chairs are so happy & cheerful…$395 ea, 31.5x28x39″h. Seafoam distressed mirror, $236, 34.5×48″h. Salmon pink lamp, $42, 33.5″h. Clean-lined contemporary dining table in a walnut finish, $695. As shown, 90.5x40x30.5″h, including two 12″ removable leaves. Handsome striped dining chairs, $145 ea. Eight available, sold in pairs only. Accessories, $18-40. Score this modern chandelier for just $225! 30x16x48″h. Just in…PRETTY slate sofa & love in velvety microfiber. Sofa, $795, 90x35x36″h. Loveseat, $695, 64x35x36″h, Pillows, $48-$52. Deal time! Natural wicker sofa, loveseat, and coffee table in great condition just $695 for the set. Sofa measures 79x36x33″h. Pillows, $12 ea. We don’t take many antiques, but we could not resist this piece. Take this spindle bench home for $450, 44x26x48″h. Pillows, $25 ea. Plush and comfy gunmetal grey sofa, $695, 91x36x36″h. Adorable doggy art, $52 ea, 28.5″ square. Equestrian art, $316, 37×48.5. Seagrass storage ottoman, $295, 38x20x18″h. Starfish, $6 ea. On consignment, striped accent chair just $175, 27x24x38″h. This linen look sectional is a great buy at $1,195. 115×85. Pillows, $18-$52. Want a UNIQUE coffee table? Look at these lovely consignment arrivals. Hardwood trunk with brass fittings, $295, 48x18x19″h. Pretty blue/gray sectional with nailhead trim, $1,295. 123x83x36″h. Love pillows, $42 ea. Wooden coffee table, $76, 48x28x18″h. Another consignment score that is LIKE NEW…six drawer chest, $295, 36×17.5×48”h. Coordinating bedside tables, $145 ea, 22x16x27.5”h. Just in on consignment…handsome striped spindle chair just $350! 28”w. Just in…Beige SLEEPER sofa-chaise combo, brand new $1,095. 81×62. Uber glam champagne credenza, $695. 70x18x34”h. Taupe designer lamps, $125 ea, 35”h. Abstract art, $145, 38×38. Lime green bonded leather storage bench won’t last long. $225, 50x19x17”h. Lol…Haley playing around with these ADORABLE children’s chairs. Imagine them with a teddy-bear by the Christmas tree. $45 ea. Approx 24”h. On consignment…cool cork top desk just $175. Two available. 59×28.5×29″h. You can buy this 47” Uttermost clock online for $415 or buy it here for $247. Never pay retail! Such a pretty bench…brand new for $295. 59x18x1″h. You must see this classic cane accent chair in person…beautiful! $275, 28x30x40”h. Throw, $42. Pillow, $12. 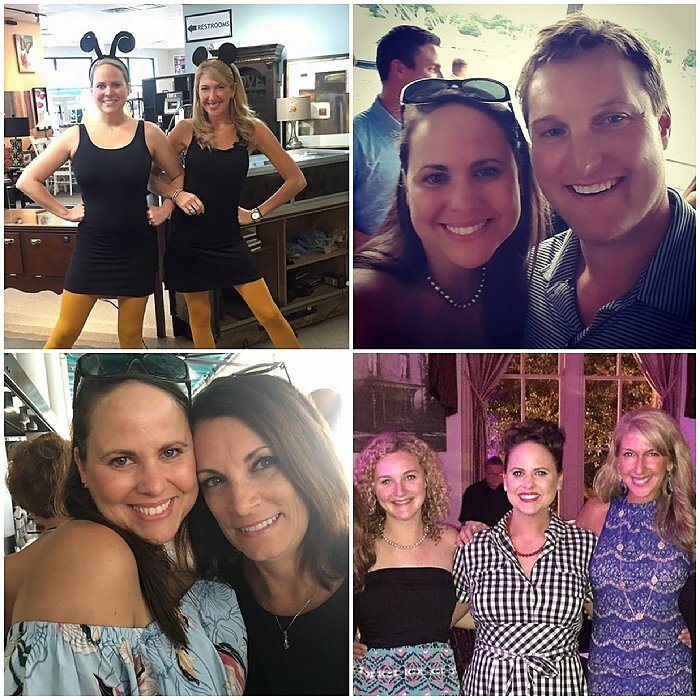 Many of you will remember Jenna Malowany, our Lumina Gem manager for five years. Much to our loss, she moved to FL last year with her husband. 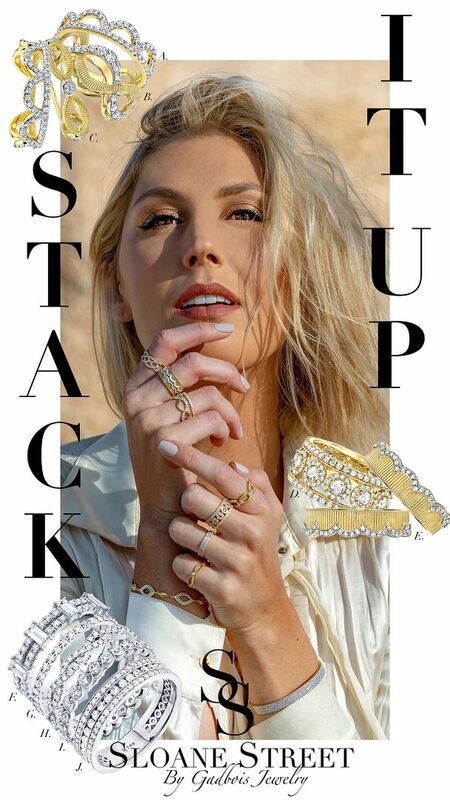 We are beyond THRILLED to have her back for a few days showing the jewelry line she is now representing, Sloane Street. 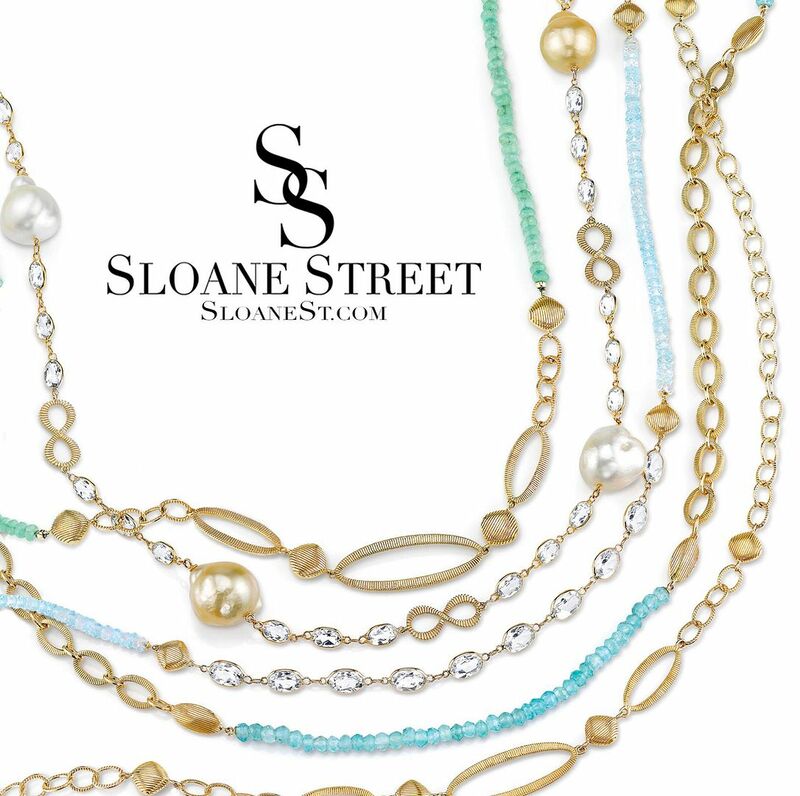 Designed by a mother & daughter, Sloane Street is classic and beautiful. We will have this awesome line (and Jenna!) in store October 20th & 22nd. 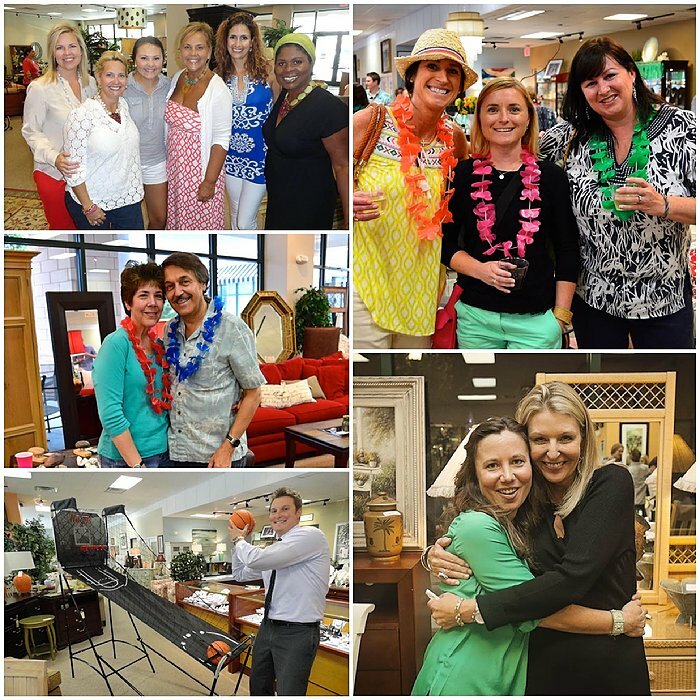 Don’t miss out on these pieces here Saturday and Monday only! 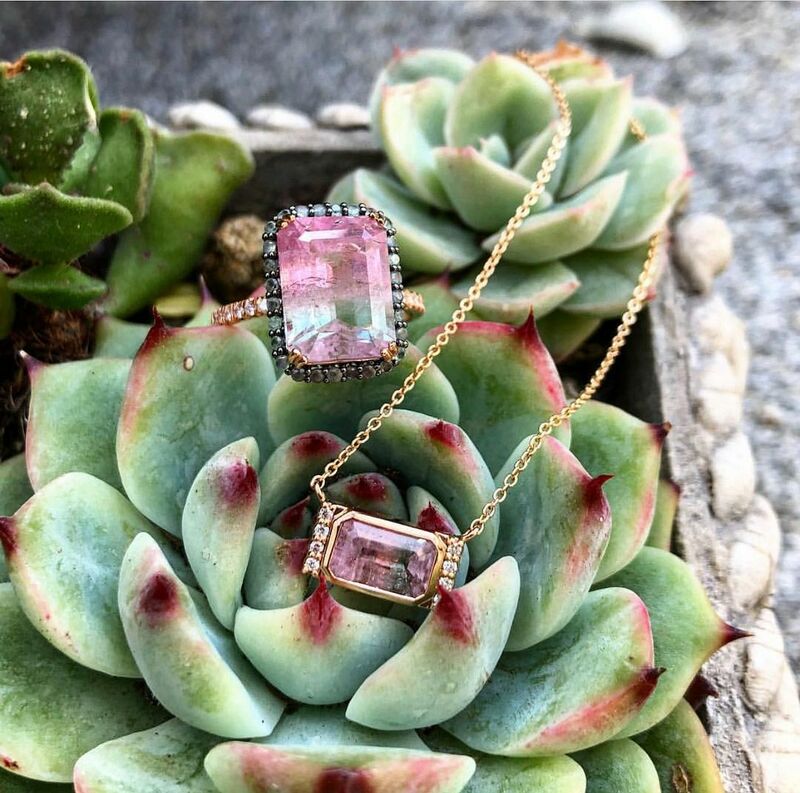 And don’t forget, now through the end of October, we are offering 10% off all in stock jewelry and donating a portion of the proceeds to local hurricane relief efforts. 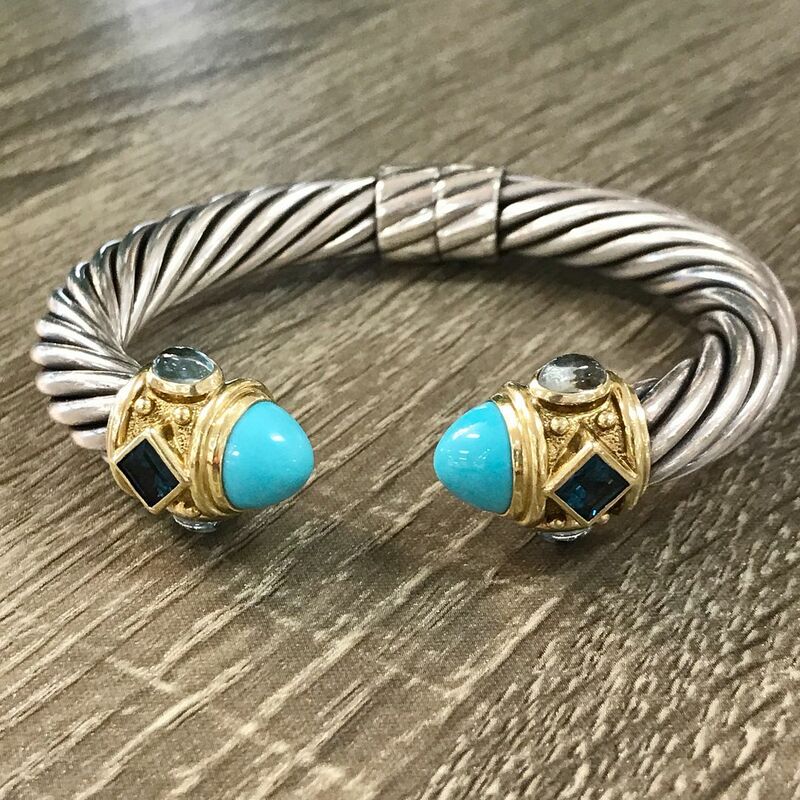 David Yurman ‘Renaissance’ hinged cuff with turquoise, aquamarine, and London blue topaz in sterling silver and 18k gold, $2,395. Tiffany & Co sterling silver large “X” earrings, $275. 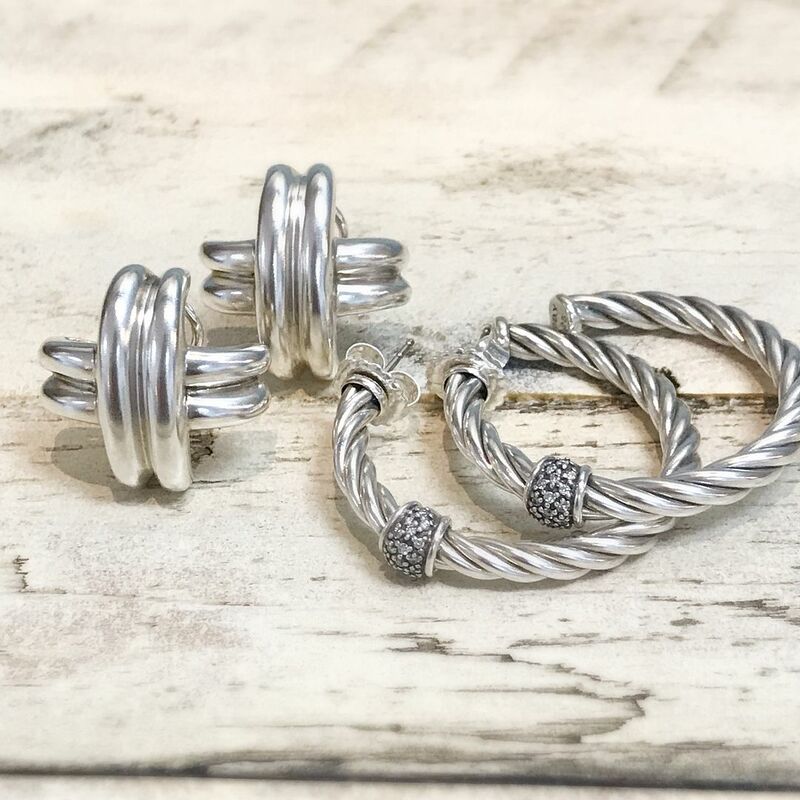 David Yurman diamond and sterling silver hoops, $495. 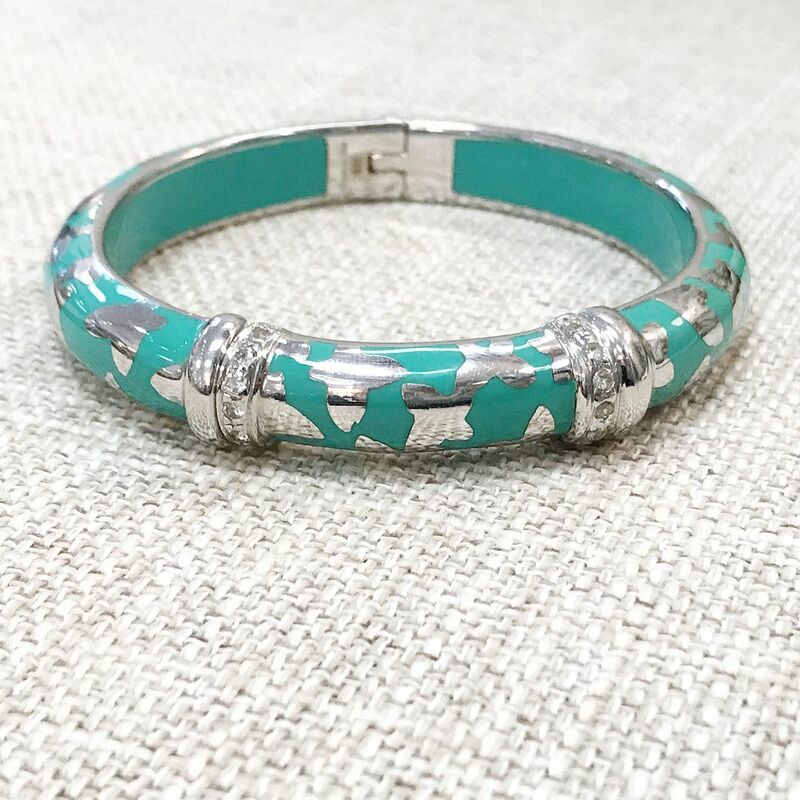 Angelique de Paris Sterling Silver Turquoise Enameled Bracelet, $195. 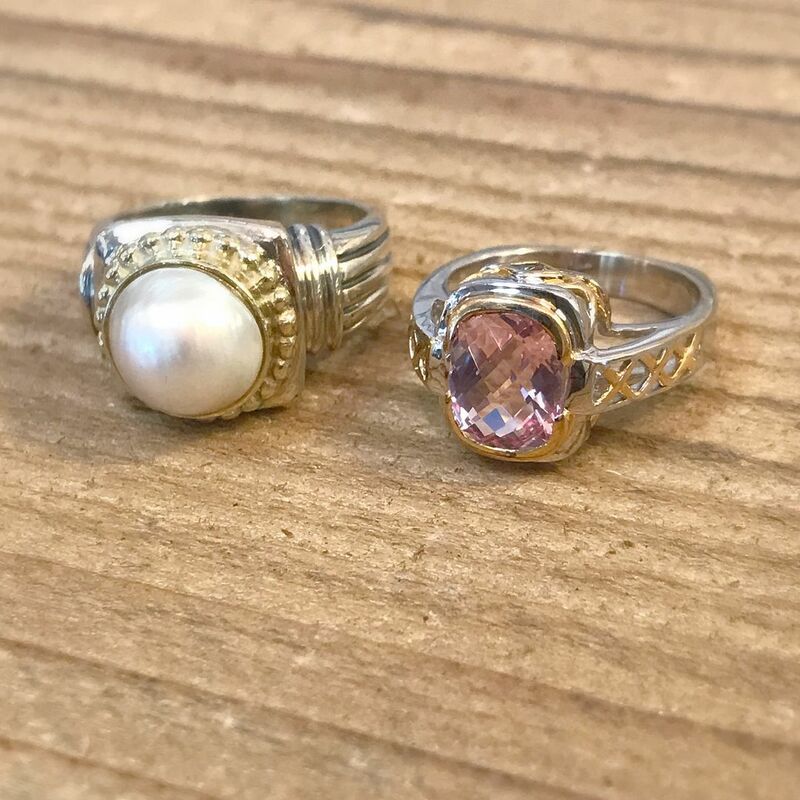 Mabe pearl column ring in 14k yellow gold and sterling silver, $295. 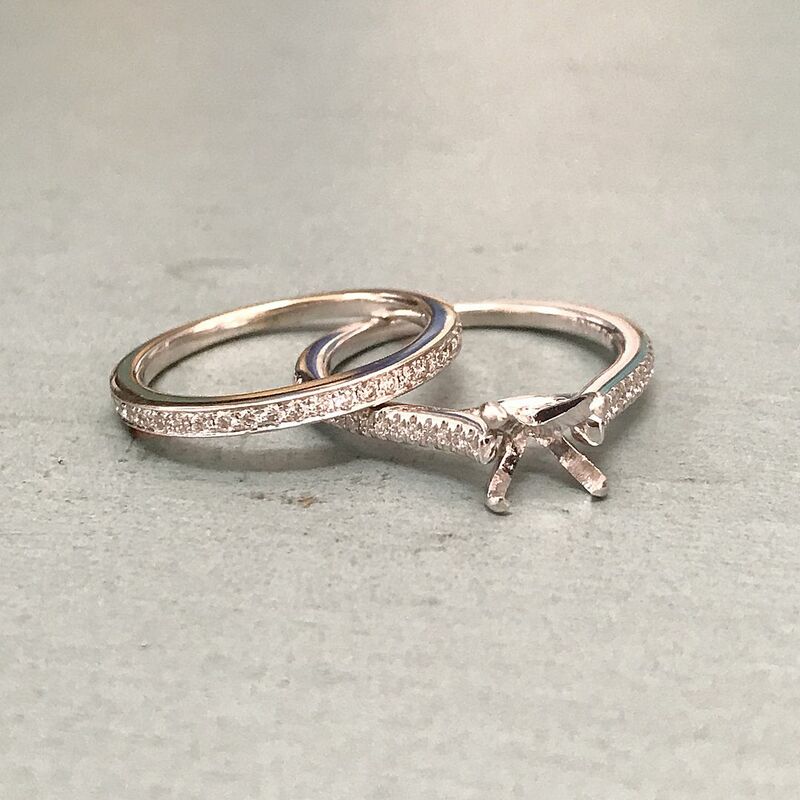 2.12ctw morganite in 18k yellow gold and white gold setting, $650. A clean and simple elegant design. 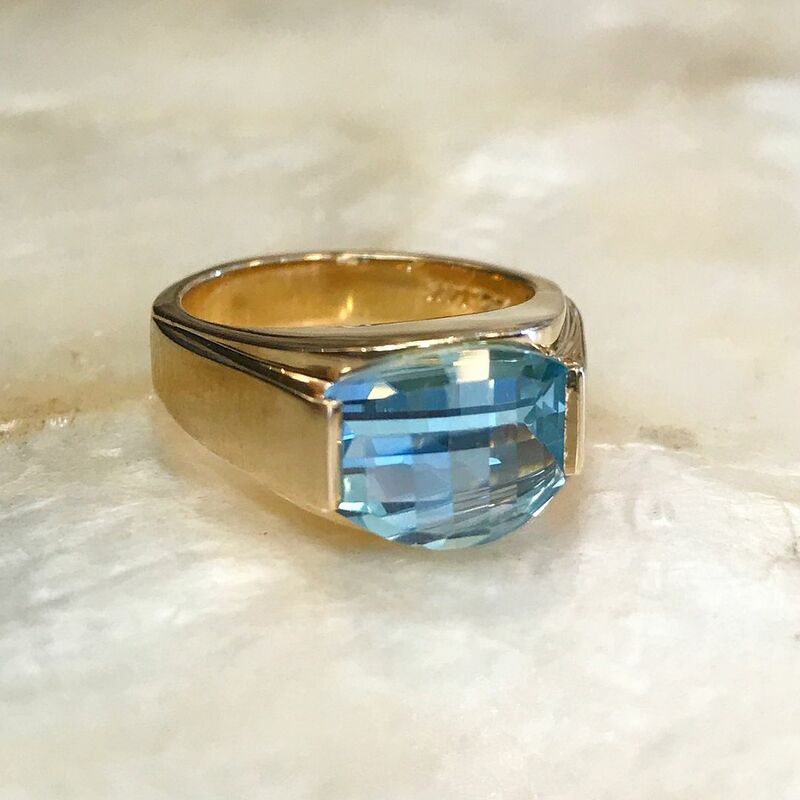 Blue topaz and 14ky gold ring, $395. Sterling silver turtle necklace, $65. 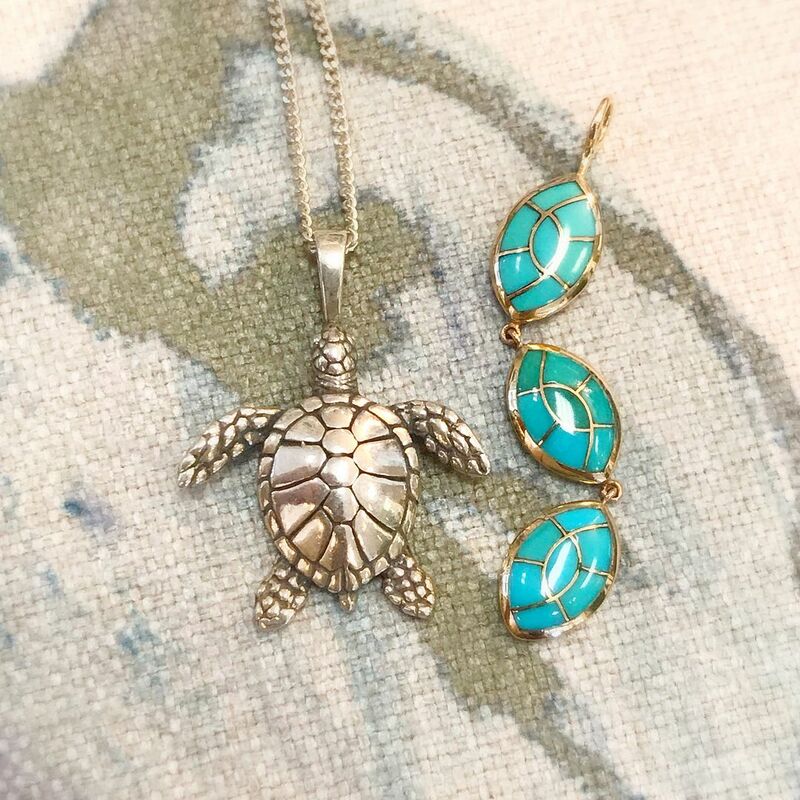 Turtle shell inspired turquoise and 14ky gold pendant, $295. Platinum and diamond eternity band, size 4.5, $895. .70ctw diamond and 18kw gold semi-mount, $995. Consignment score…Scott Kay .20ctw diamond an 14kw gold semi-mount, $895. 1ctw diamond and 18ky gold pendant, $2,995. 18ky gold wheat bracelet, $1,695. 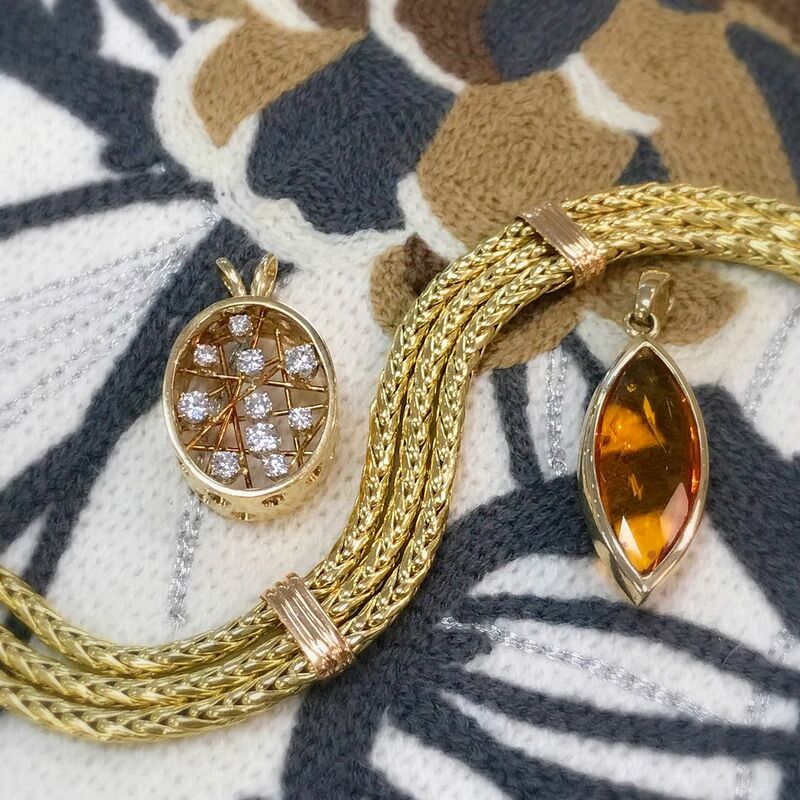 Citrine and 14ky gold pendant, $345. 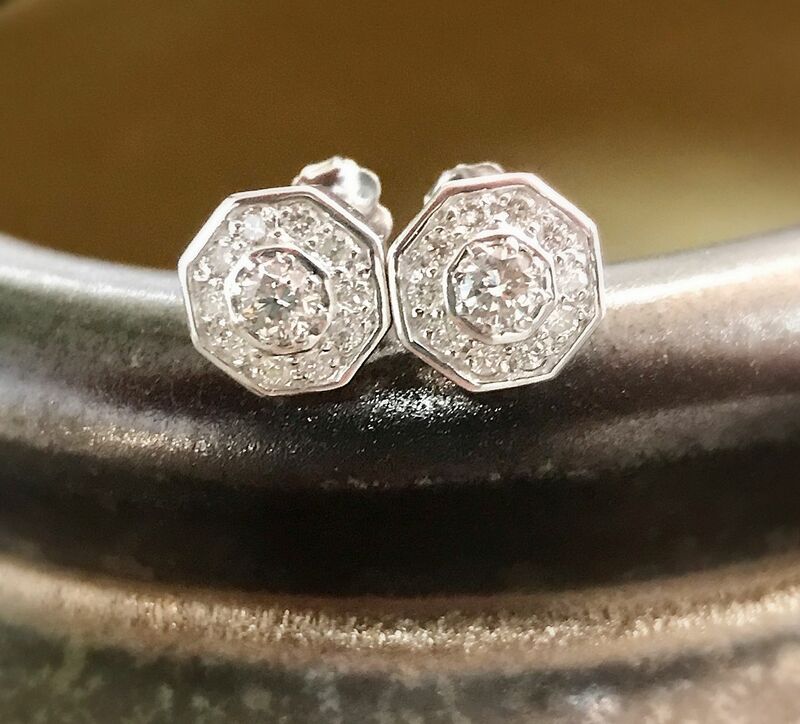 Diamond cluster octagon shaped earrings in 14kw gold, $575. 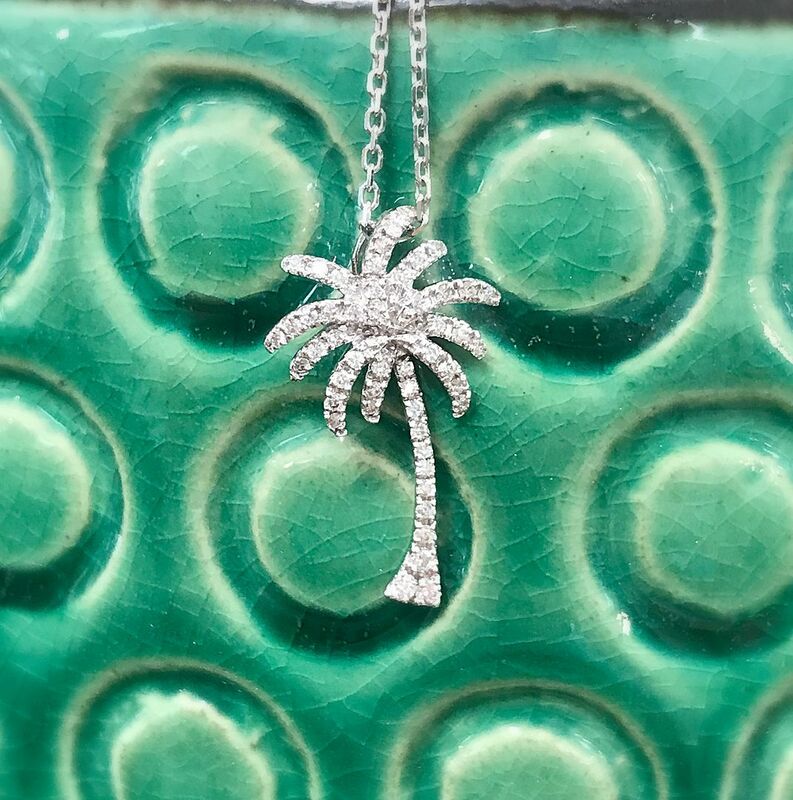 .25ctw diamond palm tree pendant in 14kw gold, $795. 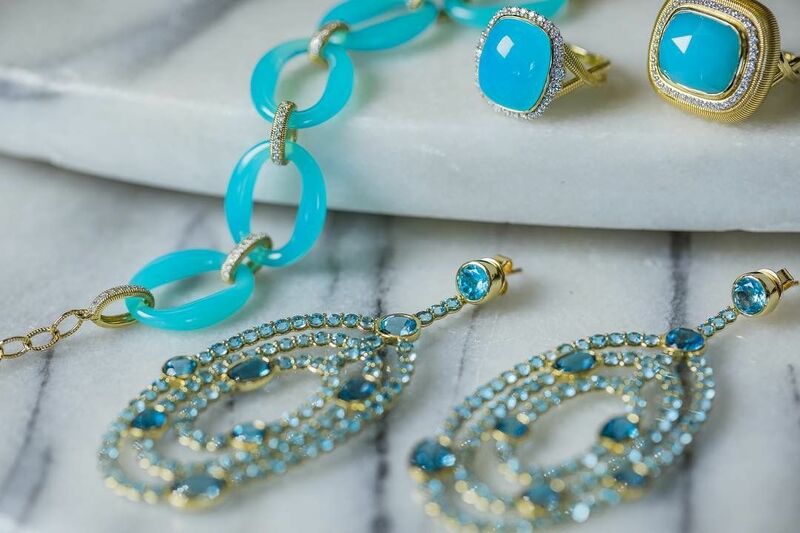 Don’t forget to come say hi to Jenna and check out the Sloane Street trunk show Saturday and Monday. And mark your calendar for our party! October 25 6-8. 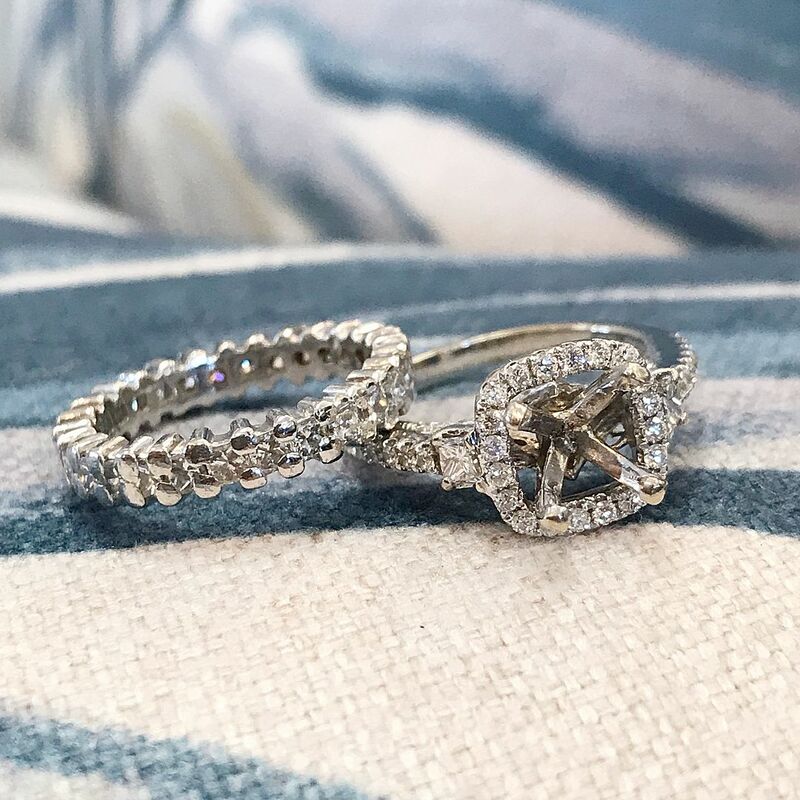 Because love is always a reason to celebrate! NAMASTE, y’all….Get ready for a BIG SHOW!